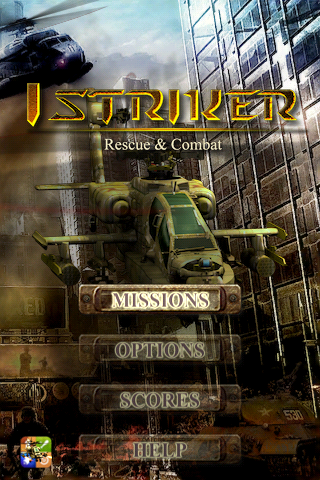 iStriker: Rescue & Combat – Time for some shock and awe! 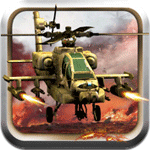 iStriker is similar to other top-down scrolling shooter that includes a lot of seemingly limitless enemies which are both in the air and on the ground. Each level is a journey that ends with a boss fight. Whenever you run out of lives (you have three to start with) a high-score is given which is then uploaded to Game Center, if you have it. The game uses both touch and tilt controls. Using touch you can guide the helicopter with you finger on the screen and tilt is where you use the iDevices accelerometer. Personally, I like the touch control since I feel like it has better feedback and the tilt controls can be a little hard to use for my tastes. 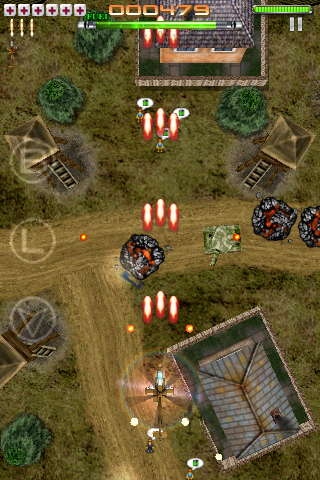 On the left side of the screen are three buttons: one for a laser, another for a bomb, and the last is to land the aircraft. The first two are standard super weapons, but landing the aircraft in a battle zone sounds crazy; and this is kind of where the game sets itself apart. 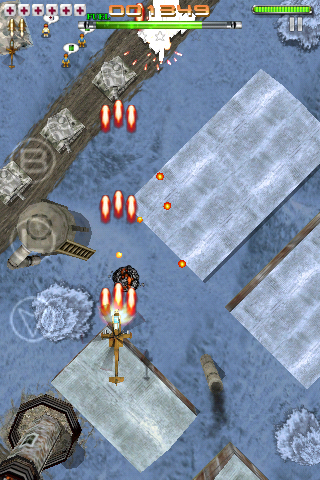 The rescue part of the game comes in when you get powerups and fuel for your helicopter. When you land and rescue civilians which have fuel, health, or ammo you complete that level. The landings need to be timed right because if the bottom of the screen catches up before taking off you will miss gaining the precious power-ups; which is less than ideal if there is a barrage of enemy fire, or an enemy craft itself firing at you. A neat little addition, that adds to the chaos. The graphics of the game are good enough, but what is important is that there is no slow down when there is a lot going on within the game. The sound is pretty standard and nothing to write home about, but one downside is that you can not play your own music while playing the game. It seems that should be a feature within all games. The controls are simple enough and there are two control options if you like a specific way of controlling your games. If you do find yourself within a level and do not like the control scheme you can change it in the options menu. There are six missions to chose from which are more than enough for 99 cents since they all take some time to get through. One nice thing about this game is that it does have nice replay value, sort of like an old school Nintendo game. In general, this is a fun little distraction for a dollar and the rescue part of the game adds to the strategy and changes up the basic formula of the traditional top-down shooter. Hopefully they add some more missions in the future, but as it stands right now there is plenty to do. Can not play your own music. Tilt controls can be touchy.